People voted for a racist who promised racist outcomes. They don’t deserve your empathy. 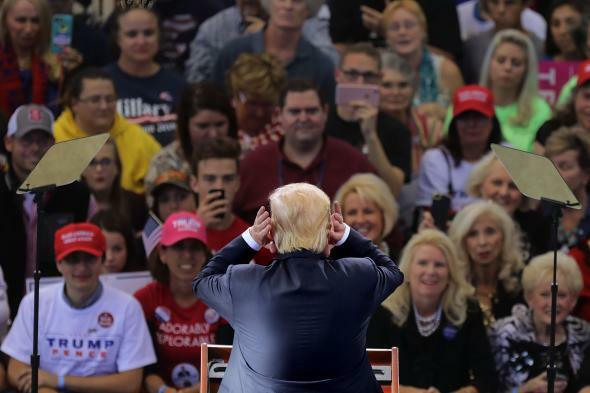 Donald Trump holds a campaign rally on Nov. 7 in Raleigh, North Carolina. Donald Trump ran a campaign of racist demagoguery against Muslim Americans, Hispanic immigrants, and black protesters. He indulged the worst instincts of the American psyche and winked to the stream of white nationalists and anti-Semites who backed his bid for the White House. Millions of Americans voted for this campaign, thus elevating white nationalism and white reaction to the Oval Office. Meanwhile, more than 300 incidents of harassment or intimidation have been reported in the aftermath of Trump’s election, according to the Southern Poverty Law Center. NBC News confirmed several, including incidents where vandals spray-painted slurs (“Heil Trump”) and swastikas on churches serving Hispanic or LGBT communities. At San Diego State University, a hijab-wearing Muslim student says she was confronted and robbed by two men who made comments about Trump, and at the University of Michigan in Ann Arbor, a Muslim student says a man approached her and threatened to set her on fire unless she removed her hijab. At the University of Pennsylvania, black members of the freshman class were added to a racist social media group, where students were threatened with lynchings. Millions of Americans are justifiably afraid of what they’ll face under a Trump administration. If any group demands our support and sympathy, it’s these people, not the Americans who backed Trump and his threat of state-sanctioned violence against Hispanic immigrants and Muslim Americans. All the solicitude, outrage, and moral telepathy being deployed in defense of Trump supporters—who voted for a racist who promised racist outcomes—is perverse, bordering on abhorrent. It’s worth repeating what Trump said throughout the election. His campaign indulged in hateful rhetoric against Hispanics and condemned Muslim Americans with the collective guilt of anyone who would commit terror. It treated black America as a lawless dystopia and spoke of black Americans as dupes and fools. And to his supporters, Trump promised mass deportations, a ban on Muslim entry to the United States, and strict “law and order” as applied to those black communities. Trump is now president-elect. Judging from his choices for the transition—figures like immigration hardliner Kris Kobach and white nationalist Stephen Bannon—it’s clear he plans to deliver on those promises. Whether Trump’s election reveals an “inherent malice” in his voters is irrelevant. What is relevant are the practical outcomes of a Trump presidency. Trump campaigned on state repression of disfavored minorities. He gives every sign that he plans to deliver that repression. This will mean disadvantage, immiseration, and violence for real people, people whose “inner pain and fear” were not reckoned worthy of many-thousand-word magazine feature stories. If you voted for Trump, you voted for this, regardless of what you believe about the groups in question. That you have black friends or Latino colleagues, that you think yourself to be tolerant and decent, doesn’t change the fact that you voted for racist policy that may affect, change, or harm their lives. And on that score, your frustration at being labeled a racist doesn’t justify or mitigate the moral weight of your political choice. In the same way that the election-year demand for empathy toward Trump supporters obscured the consequences of Trump’s support for his targets, this demand for empathy does the same. It’s worse, in fact. In the wake of Trump’s win, the United States was hit with a wave of racist threats, agitation, harassment, and violence, following a year in which hate crimes against Muslim Americans and others reached historic highs. With Trump in office, millions of Americans face the prospect of a federal government that is hostile to their presence in this country, and which views them as an intrusion, even if they are citizens. Even if they’ve lived their entire lives as Americans. To face those facts and then demand empathy for the people who made them a reality—who backed racist demagoguery, whatever their reasons—is to declare Trump’s victims less worthy of attention than his enablers. To insist Trump’s backers are good people is to treat their inner lives with more weight than the actual lives on the line under a Trump administration. At best, it’s myopic and solipsistic. At worst, it’s morally grotesque. Between 1882 and 1964, nearly 3,500 black Americans were lynched. At the peak of this era, from 1890 to 1910, hundreds were killed in huge public spectacles of violence. The men who organized lynchings—who gathered conspirators, who made arrangements with law enforcement, who purchased rope, who found the right spot—weren’t ghouls or monsters. They were ordinary. The Forsyth County, Georgia, sheriff who looked the other way while mobs lynched Rob Edwards, a young man scapegoated for a crime he did not commit, was a well-liked and popular figure of authority, as described by Patrick Phillips in his book Blood at the Root: A Racial Cleansing in America. And the people who watched these events, who brought their families to gawk and smile, were the very model of decent, law-abiding Americana. Hate and racism have always been the province of “good people.” To treat Trump voters as presumptively innocent—even as they hand power to a demagogic movement of ignorance and racism—is to clear them of moral responsibility for whatever happens next, even if it’s violence against communities of color. Even if, despite the patina of law, it is essentially criminal. It is to absolve Trump’s supporters of any blame or any fault. Yes, they put a white nationalist in power. But the consequences? Well, it’s not what they wanted. “One can be, indeed one must strive to become, tough and philosophical concerning destruction and death, for this is what most of mankind has been best at since we have heard of man,” wrote James Baldwin in his seminal work, The Fire Next Time. “But it is not permissible that the authors of devastation should also be innocent. It is the innocence which constitutes the crime.” We can hope Trump was bluffing about his promises. If not, then the next four years will be hard for the Americans he plans to target. What we cannot do is pretend this wasn’t a choice, that no one was responsible.